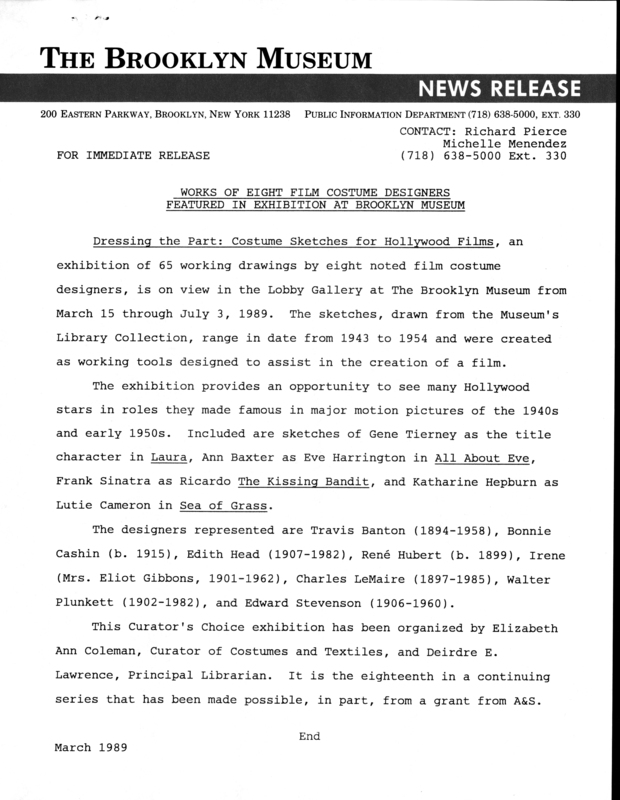 March 1, 1989 Dressing the Part: Costume Sketches for Hollywood Films,	an exhibition of 65 working drawings by eight noted film costume designers, is on view in the Lobby Gallery at The Brooklyn Museum from March 15 through July 3, 1989. 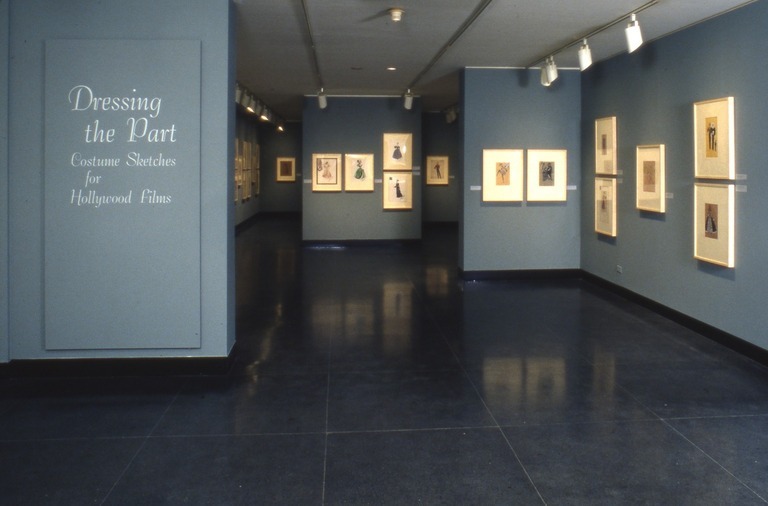 The sketches, drawn from the Museum’s Library Collection, range in date from 1943 to 1954 and were created as working tools designed to assist in the creation of a film. The exhibition provides an opportunity to see many Hollywood stars in roles they made famous in major motion pictures of the 1940s and early 1950s. Included are sketches of Gene Tierney as the title character in Laura, Ann Baxter as Eve Harrington in All About Eve, Frank Sinatra as Ricardo The Kissing Bandit, and Katharine Hepburn as Lutie Cameron in Sea of Grass. The designers represented are Travis Banton (1894-1958), Bonnie Cashin (b. 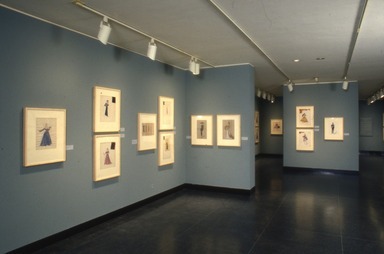 1915), Edith Head (1907-1982), René Hubert (b. 1899), Irene (Mrs. Eliot Gibbons, 1901-1962), Charles LeMaire (1897-1985), Walter Plunkett (1902-1982), and Edward Stevenson (1906-1960). This Curator’s Choice exhibition has been organized by Elizabeth Ann Coleman, Curator of Costumes and Textiles, and Deirdre E. Lawrence, Principal Librarian. It is the eighteenth in a continuing series that has been made possible, in part, from a grant from A&S. Brooklyn Museum Archives. Records of the Department of Public Information. Press releases, 1989 - 1994. 1989, 036.